You Make the Rules! and Reprogram the Cube! gave Bristol a taste of creative technology that you don’t trip over every day. Both events were Bristol’s contribution to the global Processing Community Day event with over 100 sister events around the world. Processing is an open source programming language originally designed for artists, but popular with all those who might find traditional coding a slightly daunting and unwelcoming prospect. Despite it’s welcoming nature, it is immensely powerful, and lies behind some of the most impressive digital art installations you might come across. Becca Rose Glowacki, Bristol based artist and educator, pulled together a team from her network of artists, technologists, educators and community organisations, and they set about opening Bristol’s eyes, ears and minds to new experiences through two contrasting events. The Processing foundation has a strong ethos for inclusion, creativity, and exploration, and with those in mind, You Make the Rules! was bursting with fun, technology-based activities for everyone from the very young, to those of all ages who just want to have a go. Framework, a co-working space in the heart of Bristol’s Old City, gave over their bright, airy ground floor for a day of making, learning, and growing. Alongside the two workshops, people were kept busy with the very popular Sphero robots, ‘zine making with code, sticker making, generative art made by hand and by chance, and a comprehensive library of inspiring books. Becca ran a beginners’ course in coding with Processing, using potato printing as a lead into digital mark making that everyone could follow. An engaged, super-interactive session went by in no time, and the mixed-age group followed along before exploring their own directions, getting creative, and learning new skills. The second workshop changed the tone. 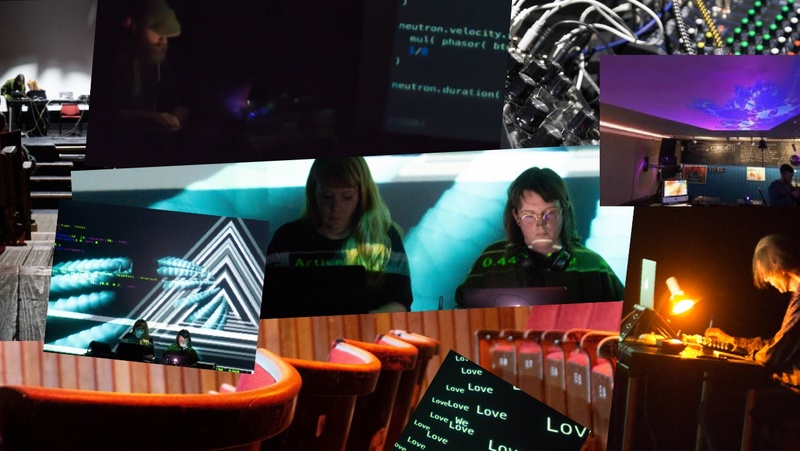 Coral Manton ran a live-coding music and visual workshop, showing some of the tools and techniques used for a growing performance art form – Algorave (more on Coral and Algorave in a moment). This drew a huge audience, and the team cleared extra space to accomodate more and more people. Coral showed people the basics and before long you saw a room full of people, on every available surface, hunched earnestly over their screens, unleashing their frustrated inner musician. They would probably still be there if Framework hadn’t needed to lock up. No-one, organisers included, knew exactly how the day would go. Any expectations about numbers, enthusiasm, and appetite for this kind of thing were blown away. There was an energy that started when the doors opened and that just didn’t stop all day. 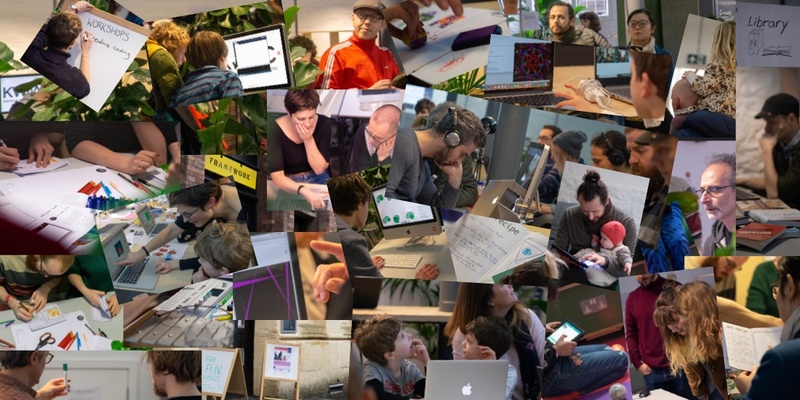 As well as families, there were people of all ages who just wanted a safe place to dip their toe into creative coding, and to overcome any fears they may have had that this was not for them. But it wasn’t all about beginners. The day provided a forum for experienced coders and digital artists to network, exchange ideas, and try out something different. The day was a celebration of technology meeting art, and it provided a platform for people to satisfy curiosity and creative itches. It could not have happened without generous logistic, equipment and funding support from Knowle West Media Centre and UWE. On reflection, it should come as no surprise that this an event like this works in this city. Bristol has art, creativity, and technology running through it’s streets. This is what the people want. The Cube cinema in Stokes Croft is tough to sum up in a few words. It’s a community-run cinema and arts venue, lovingly staffed by volunteers, that hosts an impossibly diverse range of events. Performances, readings, fringe events, and screenings all channel the ghosts of the building’s colourful history. A perfect venue then, for a set of unconventional, computer generated, live coded music and visuals. Unlike the come-and-try theme from the day, the evening was more about showing what you can do if you lock yourself in a dark place and experiment with creative technology for a while, then perform the result live in front of an audience of Bristol’s curious. Algorave is not like any other musical format. Performance is very studied and cerebral, even while the audience is having their senses assaulted by layers of sound and visuals, that are occasionally reminiscent of soviet-era psychology experiments. There is no single musical style that Algorave expects, just a scant set of rules (the Toplap manifesto) that champions experimentation, and the fact that everything must be coded live so the audience can see. There are no instruments, backing tracks or loop pedals here. Coral Manton organised friends and colleagues to entertain the innocent, unprepared ears of Stokes Croft with a tour of the Algorave landscape. Ron Herrema started us off with delicate, but complex arrangements of piano samples, playing with our expectations, hiding confounding rhythms in an illusion of simplicity. He finished his set with a visual poem (written in Processing of course) accompanied by more of his music. Leon Trimble followed with something altogether different, with a theme heavy in bass and dirty, acid squelches. Extremely satisfying, and when the music stopped, you needed a while to recalibrate your senses. During the interval, the bar was illuminated with ceiling-projected visuals made in Processing, submitted by local digital artists and dabblers. Coral Manton and Joanna Armitage welcomed us back with a joint performance, with each giving visual support to the other’s audio. Coral conjured layers of unsettling, understated glitch techno, and almost imperceptibly subtle clicks, hums and whirrs, accompanied with kaleidoscope visuals from Jo. The finale was Jo’s wonderfully unashamed, atonal, arhythmic edifice, supported by Coral’s visuals, that left a stunned, but appreciative, audience attempting to reconcile the digital mayhem with the vintage reality of their surroundings. The Cube had definitely landed in a different dimension than the one it started out in. Does Bristol need more of this? I think it probably does. Thanks again to Knowle West Media Centre and UWE for expertise, equipment, logistics and sponsorship. The Coding Train – Processing tutorials with a creative bent.